Egypt&apos;s Antiquities Ministry announced that archaeologists have discovered two ancient tombs in the southern city of Luxor. The ministry said Saturday that one tomb has five entrances leading to a rectangular hall, and contains painted wooden funerary masks, clay vessels, and a mummy wrapped in linen. LUXOR, Egypt — Egypt on Saturday announced the discovery of two small ancient tombs in the southern city of Luxor dating back some 3,500 years and hoped it will help the country’s efforts to revive its ailing tourism sector. The tombs, located on the west bank of the river Nile in a cemetery for noblemen and top officials, are the latest discovery in the city famed for its temples and tombs spanning various dynasties of ancient Egyptian history. 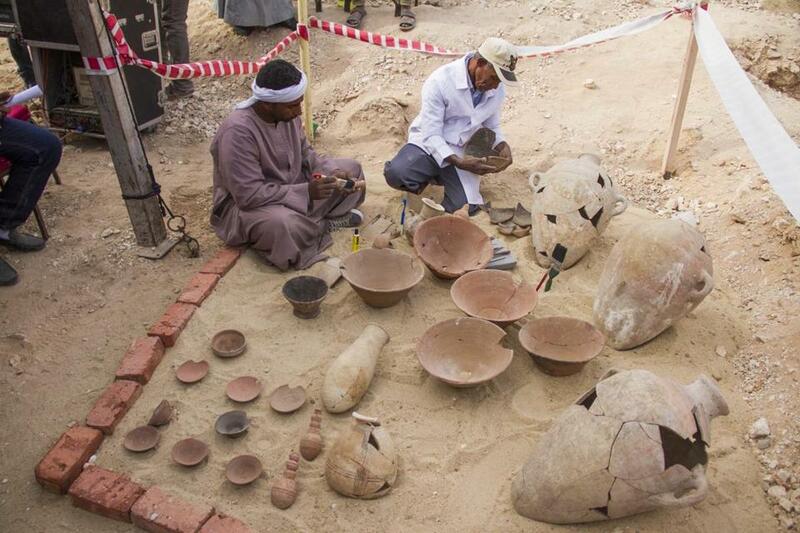 ‘‘It’s truly an exceptional day,’’ Antiquities Minister Khaled al-Anani said, noting that archeologists had explored in the inside of the two 18th dynasty private tombs for the first time. Anani said the discoveries are part of the ministry’s efforts to promote Egypt’s vital tourism industry, partly driven by antiquities sightseeing. Tourism was hit hard by extremist attacks and political turmoil after the 2011 uprising. The ministry said one tomb has a courtyard lined with mud-brick and stone walls and contains a six-yard burial shaft leading to four side chambers. The artifacts found inside included inscriptions, art, and fragments of wooden coffins. The wall inscriptions and paintings suggest the tomb belongs to era between the reigns of King Amenhotep II and King Thutmose IV, both pharaohs of the 18th dynasty, officials said. Among the artifacts found inside that one are funerary cones, painted wooden funerary masks, clay vessels, about 450 statues, and a mummy wrapped in linen who was probably a top official. The names of several persons were found inscribed on the walls and artifacts. A cartouche carved on the ceiling of the second tomb bears the name of King Thutmose I of the early 18th dynasty, the ministry said. The temple is near the Valley of the Kings, where King Tutankhamun was buried. In August, the Ministry announced the discovery of three rock-cut tombs in northeast Egypt. They belong to the 27th dynasty and are more than 2,000 years old. The tombs were found about 125 miles south of Cairo, in the Al-Kamin Al-Sahrawi district near the city of Samalut. The Egyptian Museum in Cairo in November put 95 pieces of King Tut’s treasures on exhibition. They had been locked away in storage. The artifacts, including pieces of fabric adorned with gold, were found in Tutankhamun’s tomb in the 1920’s but have been in storage for decades. King Tut’s tomb in Luxor was discovered by English archaeologist Howard Carter in 1922.